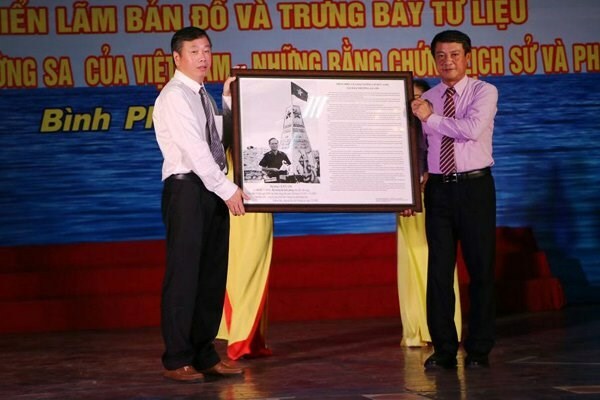 Binh Phuoc (VNA) – Nearly 100 maps, documents and publications on Hoang Sa (Paracel) and Truong Sa (Spratly) archipelagos are on display at Dong Xoai town in the southern province of Binh Phuoc. The exhibition, entitled “Vietnam’s Hoang Sa and Truong Sa: Historical and legal evidence” is jointly organised by the Ministry of Information and Communication and the provincial People’s Committee. Speaking at the opening ceremony, Deputy Minister of Information and Communication Pham Hong Hai stressed that the exhibition aims at increasing the public’s awareness and responsibility in safeguarding the country’s sovereignty over the two archipelagos. The displayed documents and materials at the exhibition are a part of the historical and legal evidence which has been collected both at home and aboard, including from China, he added. All the reproductions will be presented to the locality after the exhibition in order to continue disseminating information about the country’s sea and island sovereignty to locals.